You are here : SunHealth AZ Products OI-LIN WARM FACIAL SCRUB! A specialty formulated warming action opens pores for a deep and thorough cleansing as herbal extracts and jojoba beads help expedite the process of exfoliation. I personally just love the way my skin feels! Oi-Lin Warm Facial Scrub – The most wonderful exfoliator you can ever experience!!! 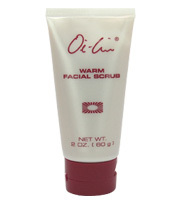 Give yourself a facial right in the comfort of your own home with Oi-Lin® Warm Facial Scrub. With warming action to open pores, you experience deep and thorough cleansing, as circulation in the face is stimulated. Super-concentrated with herbal extracts and jojoba beads, the scrub expedites the skin’s natural process of exfoliation. The massaging action tones and soothes. I just love the feeling of my skin after using the Oi-Lin Warm Facial Scrub. Feel free to order now from this page. and we know you will as well ! Be the first to review “OI-LIN WARM FACIAL SCRUB!” Click here to cancel reply.